The T-72 does have trouble with the engine compartment, and this is a similar problem to that experienced with the T-62. The T-72's 780hp diesel is larger, and yet the engine compartment has only grown slightly. 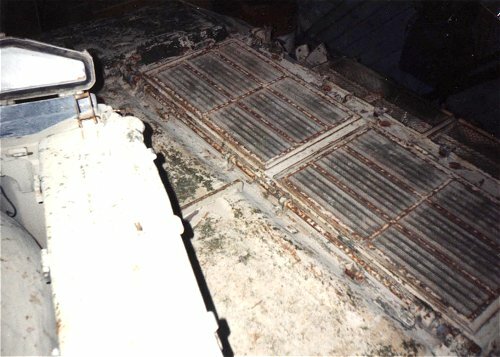 However, engine cooling has been significantly improved, allowing T-72 crews to operate their tanks in the desert heat with the rear deck grill doors closed. The T-62 occasionally ran into troubles with overheating, and it was not uncommon to see them operating in the Afghan summer with the rear grill door propped open. The T-72 can operate on three different types of fuel: diesel, gasoline, and kerosene. The driver has a switch to establish settings for whatever fuel is being used. Interestingly, this engine is once more an upgrade of the original T-34 type engine. However, Soviet engineers have finally solved many of the teething toubles in the version mounted in the T-62, and this version runs smoothly and relatively smoke free. Later models of the T-72 have an 840hp engine. right. This is the displayed T-72M1 at the Patton Museum. 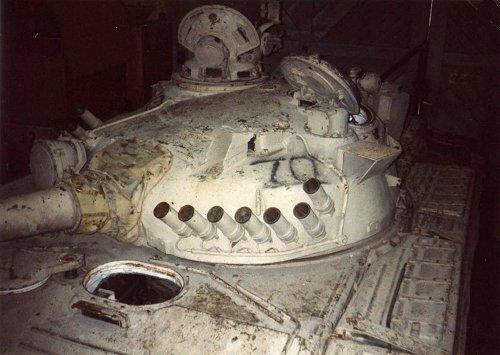 First, to the right of the turret, the small cylinder is the "dazzler"
turret in order to provide room for explosive reactive armor (ERA). 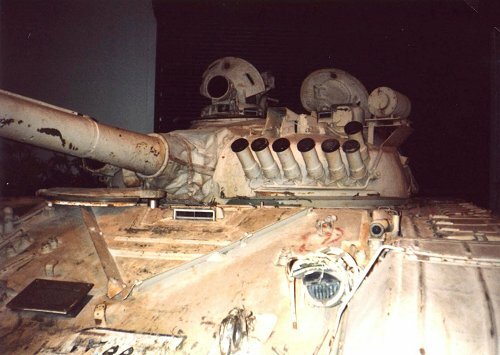 As to the speculation about the armor composition of the turret, the curator of the Patton Museum indicated there would be no way the Defense Dept. would cut open their vehicle! At right, a nice unpublished shot of a DDR NVA (East German Army) T-72M (also known in the old East Bloc as the T-72G). This tank belonged to Hauptman Stefan Kotsch, commander of the 7. Kompanie, 9. Panzer Division. 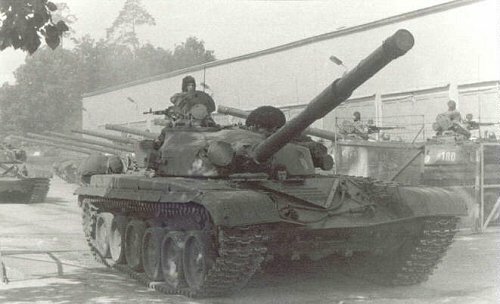 Note the maintanence bays in the background, along with the remaining tanks of the company. Also, note the absence of the main gun thermal shroud and smoke launchers.